The sculpture is hard to miss. A slender column more than eight and a half feet tall, made of tightly bundled fabrics, like a monument to clothing. Called Bale Variant #0024 (Everything), it’s a strong presence in Mia’s “Without Boundaries” exhibition, a showcase of paintings and fiber art by women artists in gallery G375. 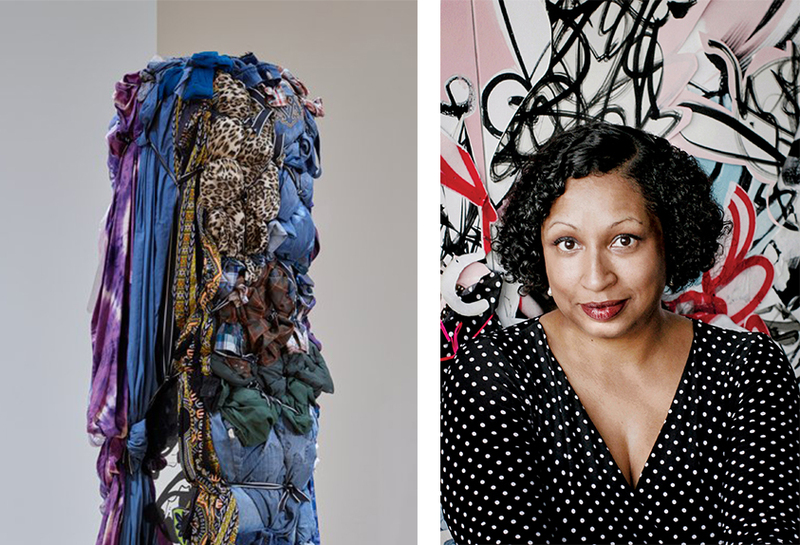 The artist behind it, Shinique Smith, will be at Mia on April 7 to talk about her work in a public conversation with Jenni Sorkin, an associate professor at the University of California who studies the intersection of gender, material culture, and contemporary art. By quite literally tying together these textile traditions—dyeing, weaving, and printing processes from India, West Africa, Indonesia, China, Korea, and the United States—Smith has erased boundaries while making a global connection. A connection, in fact, between women. And there still are. To this day, most textile artists are women, a tradition that has often passed from one generation to the next within families. Smith’s mother, for instance, was a clothing designer and fashion editor. “Bale Variant #0024” presents a lot of cultural threads to pull on, from gender roles to consumerism to our shared humanity, but it is also a unified aesthetic experience. And the myriad prints, patterns, colors, and materials that are a little (or maybe a lot) overwhelming at first glance have more in common than not, a set of answers to the single timeless question of how we will clothe ourselves.